This valley was once part of an ancient lake, which now lies approx. 60ft underground. While drilling for a well at Purdons in Killinane, a cave was discovered which led to this vast lake. In time, it is hoped to develop this area. Liscarrol’s huge 13th century castle, the third largest of its kind in Ireland, is an imposing landmark. It was built as part of a line of fortified outposts between the Norman held and Golden Vale to the north and east, and the Irish held Bogs to the south and west. Beneath the walls of the castle is the village green, a popular picnic area for the droves of tourists who visit the only donkey sanctuary in the Republic of Ireland. The green has recently been planted with a native tree woodland area and a wild flower meadow. It was at a ford close to the town, that Donal Cam O’Sullivan fought the Battle of Liscarroll, after being attacked by the English garrison aided by the Barry’s, as they passed along Knawhill to the west of the village. 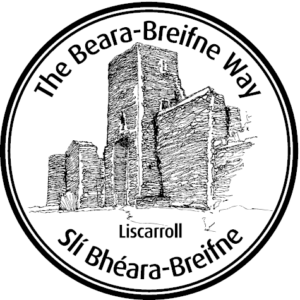 Once, Liscarroll was considered to be the cross roads of Munster; a military road ran from Cork to Mallow and on to Liscarroll, it then branched off to Kerry through Lismire and on to Limerick through Newcastlewest. With the advent of the new railway line this road division was moved to Mallow and totally by-passed Liscarroll. The area is a treasure trove to the archaeologist and historian, with what is possibly the largest number of historic sites in North Cork, from Fulach Fiadhs to 19th-century manors. 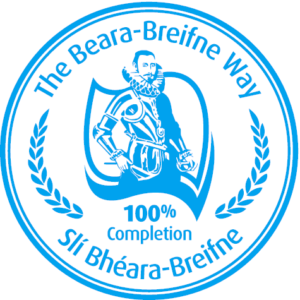 It forms part of the Ballyhoura section of the Beara Breifne Way.